Gaurav Kampani investigates a crucial research puzzle in nuclear proliferation literature, namely, the possible underpinnings of India’s slow weaponization process. Addressing the period 1989-1999, he argues that despite acquiring nuclear weapons in 1989-1990, New Delhi lacked the capability to “deliver them reliably or safely until 1994-95 or possibly 1996” (81). According to Kampani, it was internal secrecy that prevented India’s swift acquisition of operational nuclear capability. He underlines that the “hoarding and compartmentalization of information not only prevented India from coordinating the weapons development and weaponization programs efficiently, but also encouraged sequential decisionmaking” (82). Kampani’s article, which is based on meticulous attention to secondary sources, some Indian primary sources, and extensive interviews of Indian policy planners and decisionmakers— both civil and military— builds upon his doctoral dissertation, which he completed in 2013 at Cornell University. In a field that celebrates large-N studies and quantitative research, Kampani’s work stands out as an impressive single case study accomplished through qualitative data analysis. 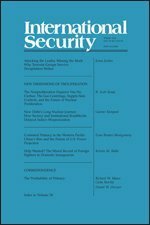 The article is divided into four main sections: the first studies the “alarmist assumptions” in the context of South Asia; the second examines what he calls the “sequential and haphazard unfolding” of New Delhi’s weaponization program from 1989 until 1990; the third investigates how internal secrecy in India decelerated the pace of weaponization; and the fourth offers an evaluation of six alternative explanations to the secrecy argument. The article concludes byunderlining policy implications that are relevant to the research findings. One of the key strengths of Kampani’s article is his astute attempt to define a nuclear device as opposed to a weapon, and the process of weaponization as distinct from the operationalization of weapons (80-81). The development of a nuclear device does not mean that the country has attained the level of weaponisation, which Kampani defines as “the process of integrating the weapon with delivery systems” (80). Nor does it mean that the country in question has also mastered the “soft institutional and organizational routines” like command and control mechanisms, coordination between scientific and military establishments, and training of military personnel for deployment and explosion of the nuclear weapons. By drawing these sharp distinctions, Kampani develops a strong critique of the alarmist tendencies witnessed especially in the context of 1990s nuclear South Asia, and more recently with respect to Iranian and North Korean nuclear programs. He argues that while such tendencies often predominate among U.S. proliferation scholars, senior bureaucrats, policymakers, and think tank experts, one must focus more on the “process of proliferation” instead of paying excessive attention to “proliferation outcomes” and their “imagined consequences” (114). Scholars have previously studied internal secrecy and its consequences in India, notably M.V. Ramana and Itty Abraham. Ramana examines the nature of the secrecy that is pervasive in India’s nuclear establishment, particularly the civil nuclear program, while Itty Abraham investigates this phenomenon with respect to military/defense science in India predominated by civilian scientists. Gaurav Kampani is the first to demonstrate how this secrecy hampered efficiency and contributed to organizational mismanagement during India’s weaponization phase, thus retarding it in the process. His research therefore adds substantial value to the prevailing literature on India’s nuclear program. Kampani’s work can be criticized, however, on the following grounds. First, his research is overly based on interviews, a large part of which are non-attributable given the conditions of anonymity that the interviewees requested. While his research strategy is understandable owing to the paucity of Indian archival data on a rather recent time period, non-attributable interviews make data excessively hard to verify. When conducting archival research, for instance, as historians we tend to cross-reference our primary source data, i.e. we try to find references to phenomenon X in archives A, B, C, D, etc, preferably in countries in Q, R, S. That way the research findings canbe traced back to multiple sources of data, which generate the same results on the phenomenon that is being studied. As is well known, no research method is foolproof, but future scholars may find it challenging to trace back data in the case of Kampani’s research. Second, while the article explores aspects like the “weakly institutionalized nuclear social network” (89) and the distancing of the military from India’s nuclear program (93), Kampani emphasizes that secrecy is the core reason behind New Delhi’s slow weaponization process. This monocausal explanation of a complex process in a large country is counterintuitive and probably incomplete. This is because at least two significant explanatory rationales are missing from his article: first, India is a developing country with high resource constraints, which may have retarded progress in the weaponization process, and second, India’s technological capacity, especially in the context of the sanctions imposed after New Delhi’s 1974 test, could have a role to play in the slow process of weaponization. Third, national nuclear programs are not insulated from foreign assistance. External nuclear suppliers can both increase and decrease the pace of a country’s nuclear program, and hence constitute an important factor. However, when Kampani compares India with all the other nuclear weapon states with the exception of North Korea (Figure 1, 87), he does not underline that most of these countries received foreign assistance with respect nuclear weapons development, e.g. South Africa received Israeli assistance, Israel received French assistance, Pakistan received Chinese assistance, and China received Soviet assistance until the Sino-Soviet split. While India received civil nuclear assistance from countries like Canada, the United Kingdom, the United States, and France, there is no knowledge of New Delhi benefiting from foreign help with respect to its development of nuclear weapons. Moreover, with the exception of France, none of these countries dedicated economic and technological resources to their civil nuclear programs prior to weapons development. Like France, civil and military facilities were not separated in India until the 2008 U.S.–India civil nuclear agreement, thus making it hard to ascertain when investments were made solely for military purposes. Fourth, while the article pays considerable attention to the Indian Air Force, as the key transporter for the delivery of nuclear weapons, it ignores India’s space program that enabled New Delhi to build its missiles. The close relationship between missiles as delivery systems for nuclear weapons characterized the superpower arms race during the Cold War, and remains relevant to this day. The time period under Kampani’s study witnessed progress in India’s space program, which he only briefly alludes to in footnote 73, without conferring much weight on it. Greater attention to the space program could have enabled Kampani to have presented a more complete picture of the weaponization process on the one hand, and also to have explored the international character of technological cooperation relevant to India’s nuclear program on the other. Finally, he makes an allusion to a possible role of the United States without explaining it fully. He underlines that the “difficulties of persuading the United States to accept its de facto nuclear status” also played a role in retarding New Delhi’s nuclear weaponization process (111). Is he referring to the Washington-led technological controls that were imposed on New Delhi after the latter’s 1974 nuclear test that may have had a delaying impact? Or is he hinting at a possible Indian strategy to evade detection of its weaponization by U.S. intelligence, and therefore ‘going slow’? Since he follows up this section with references to U.S. nonproliferation efforts, it is possible that he intended to mean the restraining efforts of the United States, without underlining exactly how they may have worked (or not) in the Indian case. Nevertheless, Kampani’s criticism of the linearity of expectations with respect to nuclear proliferation (i.e. device to weapon to delivery systems to operationalization) while censuring the ‘nuclear alarmists’ is an apposite one. Indeed, the ability of uranium enrichment or plutonium reprocessing by a country does not automatically translate into its capability to deliver nuclear weapons. In order to attain that stage of efficient management and use of its nuclear arsenal, the country must go through a series of steps, thus providing ample opportunity to Western nonproliferation efforts to monitor and prevent progress. On the whole, Gaurav Kampani’s article is a commendable piece of work given that it tackles a relevant and complex issue where data is indeed very scarce. Jayita Sarkar is a Stanton Nuclear Security Postdoctoral Fellow at Harvard Kennedy School’s Belfer Center for Science and International Affairs, and a visiting scholar at Harvard’s Davis Center for Russian and Eurasian Studies. She is currently completing a book manuscript on Franco-Indian and Soviet-Indian nuclear relations and U.S. nonproliferation efforts during the Cold War. Jay holds a Ph.D. in International History and Politics from the Graduate Institute Geneva. See for instance Matthew Kroenig, Exporting the Bomb: Technology Transfer and the Spread of Nuclear Weapons (Ithaca, NY and London: Cornell University Press, 2010); Matthew Fuhrmann, Atomic Assistance : How “Atoms for Peace” Programs Cause Nuclear Insecurity, Cornell Studies in Security Affairs (Ithaca: Cornell University Press, 2012); Nuno Monteiro and Alexandre Debs, “The Strategic Logic of Nuclear Proliferation,” in Nuclear Studies Research Initiative Launch Conference (Austin, TXOctober 2013). M.V. Ramana, The Power of Promise: Examining Nuclear Energy in India (New Delhi: Viking, 2013). M. V. Ramana and C. Rammanohar Reddy, Prisoners of the Nuclear Dream (Hyderabad, A.P. : Orient Longman, 2003); Itty Abraham, “India’s ‘Strategic Enclave’: Civilian Scientists and Military Technologies,” Armed Forces & Society 18, no. 2 (1992). For key readings in the literature see for instance George Perkovich, India’s Nuclear Bomb: The Impact on Global Proliferation (Berkeley, Los Angeles, London: University of California Press, 1999); Raj Chengappa, Weapons of Peace: The Secret Story of India’s Quest to Be a Nuclear Power (New Delhi: Harper Collins, 2000); Itty Abraham, The Making of the Indian Atomic Bomb : Science, Secrecy and the Postcolonial State, Postcolonial Encounters (London and New York, NY: Zed Books, 1998); Jahnavi Phalkhey, Atomic State: Big Science in Twentieth-Century India (New Delhi and Ranikhet: Permanent Black, 2013); Stephen P. Cohen, Nuclear Proliferation in South Asia : The Prospects for Arms Control (Boulder, Colo.: Westview Press, 1991); G. G. Mirchandani, India’s Nuclear Dilemma (New Delhi,: Popular Book Services, 1968); Sumit Ganguly and S. Paul Kapur, India, Pakistan and the Bomb: Debating Nuclear Stability in South Asia (New York: Columbia University Press, 2010); Vipin Narang, Nuclear Strategy in the Modern Era : Regional Powers and International Conflict, Princeton Studies in International History and Politics (Princeton: Princeton University Press, 2014). See Alexander H. Montgomery, “Stop Helping Me: When Nuclear Assistance Impedes Nuclear Programs,” in Nuclear Renaissance and International Security Workshop (Georgia Institute of Technology, Atlanta, GA, 2010). See Ashok Maharaj, “An Overview of Nasa-India Relations,” in Nasa in the World: Fifty Years of International Collaboration in Space, ed. John Krige, Angelina Long Callahan and Ashok Maharaj, Palgrave Studies in the History of Science and Technology (New York, NY: Palgrave Macmillan, 2013).